To understand how the Zone Anti-inflammatory Lifestyle diet controls the balance of eicosanoids, it is wise to understand how the actual building blocks of eicosanoids are made. Eicosanoids are made from fatty acids (FA) that the body cannot synthesize, therefore the FA must be consumed in the diet. The two essential FA necessary for making eicosanoids are omega 3 and omega 6. Omega 6 FA determines the balance between “good” and “bad” eicosanoids whereas omega 3 FA only make neutral eicosanoids. Omega 3 FA are important because they play a key role in controlling whether the omega 6 FA end up being the building blocks for “good” or “bad” eicosanoids. Most omega 6 FA in the diet come from linoleic acid. Common sources or linoleic acid are vegetable seed oils such as corn oil, soybean oil, safflower oil and sunflower oil. These are the oils that are most commonly used in the North American diet both at home and dining out. Common sources of omega 3 FA include fish oil, algal oil, squid oil, some plant oils and flaxseed oil. 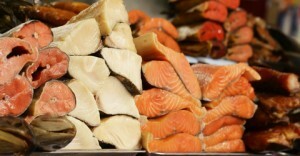 Most North Americans are not getting enough omega 3 FA from the diet. Why is it that most of us in North America are not getting enough of the omega 3 FA in our diets? 1. We do not eat enough wild fish because it is quite expensive to ship inland. Thus, it increases the price of fresh fish, making it more challenging to fit into our budgets. 2. The method of extracting oils from fish and plants, including flaxseed is intricate and costly because it needs to be completed at low temperatures, so as to preserve the quality of the end product…the oil. 3. Beef, pork and chicken are much less expensive and thus more affordable. It is mass produced, and this drives the price down. 4. Farmed fish do not contain the same high quality of omega 3 FA. When we are unable to consume enough of the best omega 3 FA in our diets, we run the risk of more of the bad eicosanoids taking over our bodies and thus our health. Check to see where you fall on the anti-inflammation continuum.